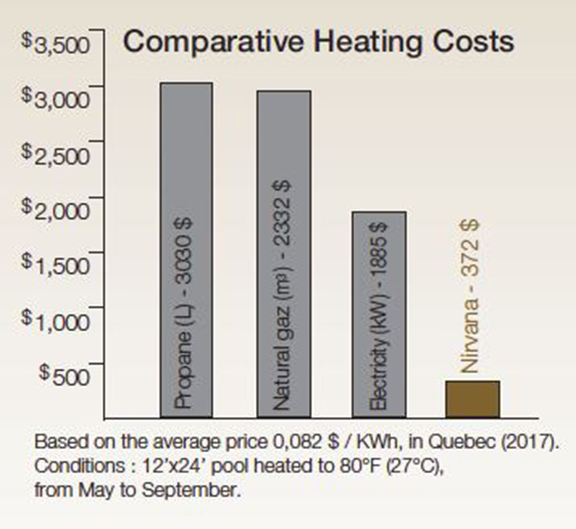 Nirvana Electric Pool Heat Pump - Ideal Distributing, Inc. The Nirvana pool heat pumps are compatible with all type of pool and spas. Effective with all water treatment systems (chlorine, salt, etc.). WHAT SIZE DO I NEED FOR MY POOL? Variable speed with SMART FAN* technology Smart mode optimizes COP. Quiet mode reduces fan speed to lower noise. Boost mode increases thermal output (BTU) of the unit. Our unique double coil heat exchanger is manufactured out of titanium to produce optimal heat transfer while resisting corrosion and erosion. It is excellent for all common pool chemical systems, including chlorine and salt water. Scroll compressor technology provides the Nirvana with unparalleled efficiency along with quiet, sustainable and proven reliability. The Thermostatic Expansion Valve maximizes performance by automatically regulating the supply of refrigerant to the evaporator in all weather conditions.